A ragged England survived a major scare in their opening World Cup match as they beat a spirited Netherlands with only eight balls to spare in Nagpur. All-rounder Ryan ten Doeschate smashed 119 from 110 balls as the Dutch took advantage of some poor England bowling and abject fielding to post 292-6. 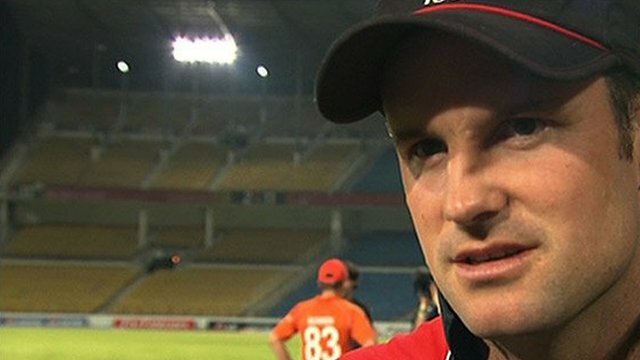 Andrew Strauss (88) and Jonathan Trott (62) gave England a solid start. But after runs dried up in the middle overs, Paul Collingwood and Ravi Bopara (both 30 not out) saw England home. The duo brought a nerve-wracking run chase to a conclusion in the penultimate over, with Bopara crashing a six and two fours off medium pacer Bernard Loots. However, the day belonged to South Africa-born Ten Doeschate, whose innings paved the way for the closest finish yet of the 2011 World Cup. After taking 12 balls to get off the mark, he thereafter scored at a rate of a run per ball, scampering intelligent singles, smashing nine fours and three huge sixes. 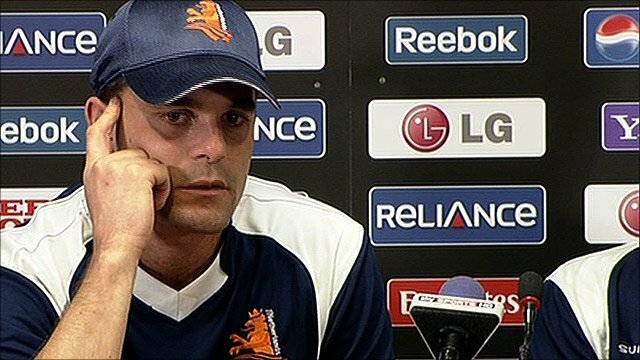 But, for all the Essex all-rounder's brilliance, Ten Doeschate was also helped by a wretched performance in the field from England, whose body language was devoid of the energy and aggression that won them so much praise during the 2010-11 Ashes series in Australia. The negative vibe was encapsulated in a horrible mix-up between Kevin Pietersen and James Anderson, who allowed a skied drive from Ten Doeschate - on 47 - to drop harmlessly between them to the obvious anger of bowler Graeme Swann and the general bemusement of all those watching. The innings was punctuated by mis-fields, no-balls, and untidy wicketkeeping by Matt Prior, while both Pietersen and Trott spilled difficult chances, which on a good day would have stuck. In the penultimate over, captain Peter Borren was bowled by Stuart Broad but he was recalled because England only had three men inside the circle, one fewer than the regulations permit. And, to round off a comedy of errors, in the last over Swann allowed a routine chance to slide inexplicably through his fingers. The performance may prompt a rethink ahead of Sunday's day-night Group B match against India after the decision to leave out left-arm spinner Michael Yardy backfired. Back-up spin bowler Pietersen gave away 19 runs from his two overs, while a lack of alternatives meant an off-colour Anderson (0-72) was obliged to run through his full 10 overs. The Dutch had made a positive start to their innings with Wesley Barresi striking three fours off an over from Broad. But, in the following over, Tim Bresnan made the breakthrough as Worcestershire opener Alexei Kervezee's attempted pull skimmed off the top edge of his bat and into the gloves of Prior. Netherlands' bright start forced Strauss to turn to the spin of Swann in the 12th over and England's off-spinner reproduced his handy habit of striking in his first over. A skilfully flighted ball at a tempting length outside off stump passed Barresi's outside edge and Prior whipped off the bails moments before the batsman could get his foot back behind the line. Tom Cooper, dropped by Pietersen at fine-leg on 46, was out one run later when he flicked a Collingwood ball straight to Anderson at mid-on. Bas Zuiderent got himself squared-up and gifted a dolly of a catch to Collingwood and Tim de Grooth was bowled by a Broad yorker after a decent 28 off 31 balls. Ten Doeschate motored into the 90s with two successive fours off Bresnan before reaching three figures courtesy of more hapless fielding from England as Trott's attempt at a run out cannoned off the stumps and flew away to the boundary for four overthrows. A magnificent innings finally came to an end in the penultimate over when a slog off Broad picked out Bopara at deep square leg. But there was still time for the Dutch to take advantage of some comical fielding to post the second highest total by an associate nation against a Test side in all one-day internationals - behind Zimbabwe's 312-4 against Sri Lanka in 1992. Strauss set the tone for England's reply with three fours in the first over, one of which flew off an edge and almost took out his off stump. With the Dutch bowlers struggling to adjust their line to the left-hander, the England captain made the most of some leg-stump bowling to race to his fifty off 34 balls with nine boundaries. Pietersen made a positive start to his innings before getting bogged down by some tight bowling, and prodding left-arm spinner Pieter Seelaar straight to short extra cover for 39. Strauss looked on course for his sixth one-day international hundred before he got a little greedy and pulled the ball straight to deep square leg. Trott and Ian Bell kept things ticking along with ones and twos but with the required run rate creeping above seven and boundaries a rarity, the game remained in the balance going into the final 10 overs. Ten Doeschate proved his qualities with the ball by having Trott stumped and clean bowling Bell, who only managed one boundary in his 40-ball 33. That left Collingwood and Bopara needing 52 from 7 overs and luckily for England they were up to the task.